Why make a stuffed animal hammock? Stuffed animals and dolls can rapidly take over a child's room, and they consider them their friend that couldn't possibly be stuffed in the closet. 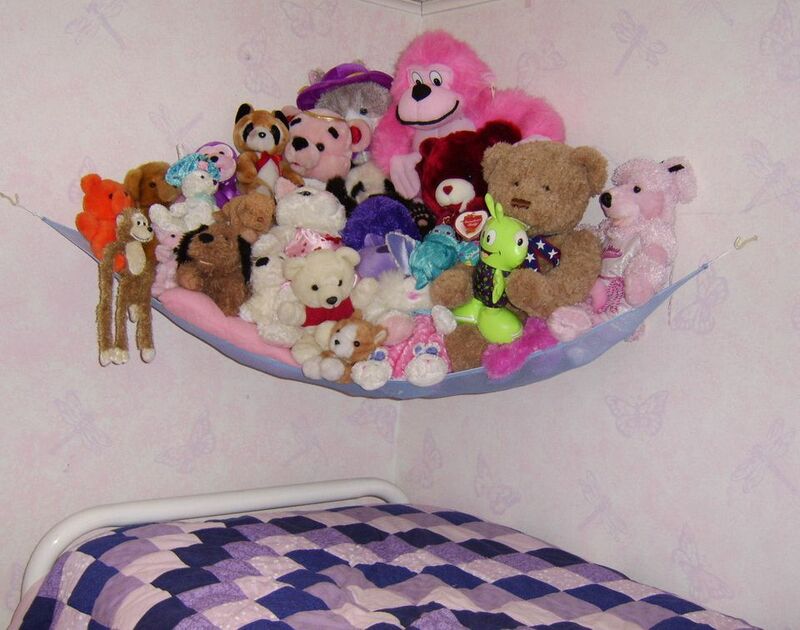 This hammock solves the problem and keeps the stuffed toys in one location. 1 3/4-2 yards of 60" wide fabric—a fabric with some stretch works best. This is enough fabric for two hammocks. Open the fabric to a single thickness. Press the folds flat. Fold the fabric cut edge to meet the selvage, creating a triangle. Cut the fold of the triangle edge (this will be a bias edge). Cut off each corner, so there is 2" across the corner. Turn under each corner 1/4", turn under another 1/4" to enclose the raw edge. Press and stitch the corners in place. Repeat for all three corners. Turn under and press 1/2" on each side. Turn under another 1/2" to enclose the raw edges. Insert the drapery or craft cord in the fold, leaving a few inches out at the corner. Stitch the inside folded edge on each side (keeping the cording away from the stitching) stopping and leaving a 2 inches loop of cord at each corner. When all the sides are sewn, knot the ends of the cord. Knot again. Hand sews the knot together if you are not secure about the knot staying knotted. Work the knot into the side seam by pulling from another corner. Evenly distribute the cord to have an even amount of cord at each corner. Knot the cord just past the ends of the fabric. Stitch through the fabric at the corners, sewing over the corner to lock it into place. Place one hook at the corner of the wall and a hook out from the corner, the length of the sides of the hammock. Make another one for another corner of the room, if there are more stuffed animals than the hammock.